On the day after Thanksgiving, buyers will be flocking to stores and online retailers to find the best deals of the year. But, according to Trulia, real estate’s Black Friday happened three months ago, when sellers are anxious to move their home off the market before the fall and winter months set in. Buyers are most likely to snag a deal in August when 13.9 percent of listing prices will be cut. Fast forward to December, and only 8.3 percent of listings will have slashed prices, thanks to sellers and agents willing to wait until spring buying season. This trend doesn’t necessarily hold true in areas with year-round warm weather, such as Florida, California and Nevada. For example, in all of the major Florida markets — Tampa/St. 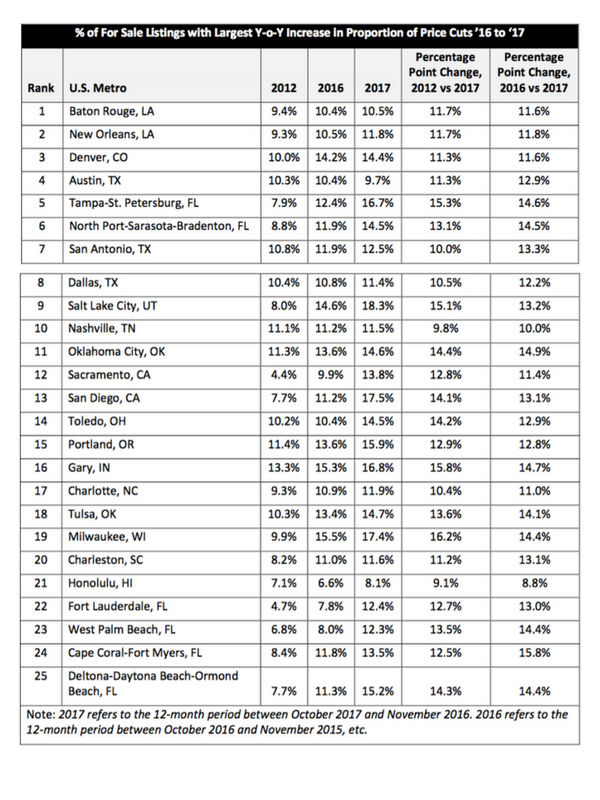 Petersburg, North Port-Sarasota-Bradenton, Fort Lauderdale, West Palm Beach, Cape Coral-Fort Myers, Deltona-Daytona, Beach-Ormond Beach — the month with the highest rate of price cuts is 1.66 or fewer times greater than the month with the lowest rate of price cuts. Meanwhile, in cities such as Fairfield County, Connecticut; Albany, New York; and Madison, Wisconsin; where winter weather is harsh, the rates of price cuts in August and September are at least 2.2 times as large as the rate in December. Where are the biggest price cuts? The share of homes going through at least one price cut has been climbing on a year-over-year basis for eight of the past 12 months. During the same 12 months a year ago, the proportion of listings going through at least one price cut increased in seven of 12 months, bringing the rate of price cuts to its highest level (13.4 percent) since 2012. Phoenix (19.1 percent); Lake County-Kenosha County, Illionis/Wisconsin; (18.6 percent); and Chicago (18.2 percent) saw the highest share of listings go through at least one price cut during 2017. Meanwhile, San Francisco (6.3 percent); San Jose, California (7.3 percent); and Oakland, California (8.0 percent); were the metros with the smallest proportion of listings that saw a price cut. Trulia says it’s important to remember that more price cuts doesn’t signal a slowing market. From early 2013 to early 2015, monthly year-over-year growth in the proportion of for-sale listings experiencing a price cut was consistent and coincided with the most rapid home price appreciation since the recession in 2007 — evidence that sellers were overzealous in determining an asking price. This report was developed using our For-Sale listing data. The report uses the entire price history of every listing found on Trulia’s website, dating back to Feb. 1, 2011 and Oct. 31, 2017. We calculated the total number of unique properties in each month and the number of unique properties each month that saw at least one price reduction. This enabled us to calculate the percentage of listings that saw a price reduction. Metro areas found in this report are metropolitan divisions where available but are otherwise metropolitan statistical areas, both as defined by the U.S. Census bureau. What's preventing another housing market collapse?